Social Networking . . . we've only just begun, to live. That is right! While some people are already board with social networking, many still have yet to harness its power. 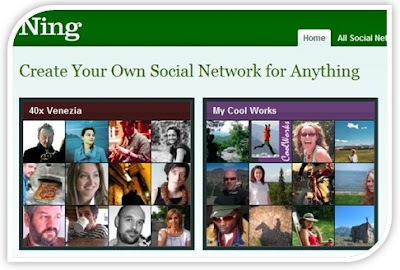 Ning, provides charities a way to create social networks around their cause. If your organization is attempting to eliminate poverty around the world, then create a social network focused on just that. Allow people and even other nonprofits to engage with your vision by giving them the tools to do so. Your charity will be positioned as one of the leaders in this cause simply by being the first to create the environment where collaboration can happen online. 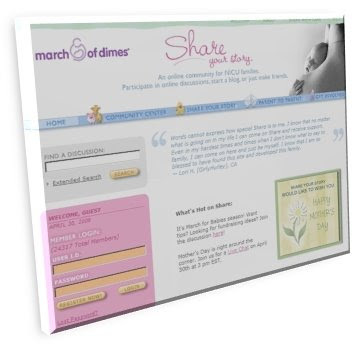 March of Dimes has created a Web site Share Your Story where Neonatal Intensive Care Unit (NICU) families can connect with each other.